A permanent exchange of information between production hall and office about the current state of the order, delivery dates and availability of resources has become part and parcel of any production company. The faster the latest information can be made available, the better the quality of all planning processes becomes throughout the entire company. And this is where INCLUDIS.Web comes into play as it delivers reliable Web-based information about your production process in real time and helps you lower your production costs. Our Web-based solution INCLUDIS.Web allows you to attain fully transparent production processes and continuous monitoring of your production (24/7) in no time at all. 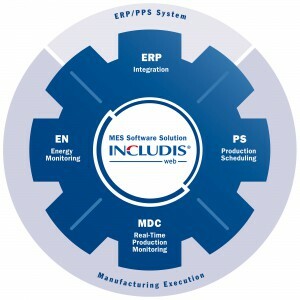 INCLUDIS.WEB supplies you with reliable figures that indicate your efficiency (O.E.E.) and monitors permanently if the production requirements as set by the ERP system are being met. You can use the appropriate reporting tools to automatically share the recorded information across your company and with the staff members in charge. Thanks to its modular design, you can expand your INCLUDIS system at any time. As a basic requirement, you should link your production facilities via intelligent automation components in order to maximize the benefit you can reap from perfect MES system integration.